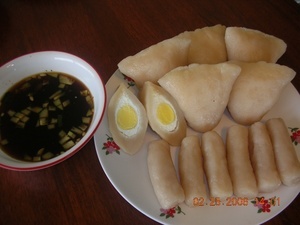 Pempek or Empek-empek is typical Palembang food made ​​from fish and sago. Actually it is difficult to say that its center isPalembang pempek because almost in all areas in SouthSumatra produce it. Presentation pempek sauce accompanied by brownish black, called vinegar or cuko (Palembang language). Cuko made ​​fromboiled water, then add brown sugar, shrimp, dried shrimp andcrushed chili, garlic, and salt. For the indigenous people of Palembang, cuko than once made ​​spicy to increase appetite.But with the entry of migrants from outside the island of Sumatrais now commonly found cuko with a sweet taste for those whodo not like spicy.